The following appear in CA&ES Currents Newsletter, August 13, 2015. Congratulations Ken!!! UC Cooperative Extension specialist Kenneth Tate is the 2015 recipient of the James H. Meyer Distinguished Achievement Award. The award recognizes a distinguished career of achievement by an Academic Federation member. A secondary but important consideration is voluntary service to the campus, UC community, or state, regional, or national bodies. Tate has compiled an impressive record of collaborative and solution-oriented research addressing agricultural and environmental issues across California's 57 million acres of rangeland. He provides science and education leadership to California's diverse rangeland stakeholders and the campus community and has been repeatedly recognized for his work on surface water quality on rangelands. He has given more than 400 extension presentations, published more than 100 journal articles, served as principal investigator on 37 research and extension grants ($6.3 million), and as co-principal investigator on another 43 research and extension grants ($5.7 million). Tate works with private landowners, agency land managers, and regulatory agency staff to understand the fate and transport of surface water pollutants. Early in his career he helped identify management practices to reduce drinking water contamination risks by livestock-borne Cryptosporidium parvum and other pathogens, which enabled ranching families to continue sustainable grazing practices on watersheds east of San Francisco. He has also worked with these groups to identify and implement realistic management practices to reduce pollutants. Tate is known for his ability to build consensus among diverse audiences on controversial topics related to range livestock production. 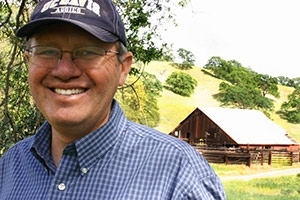 In 2011, he developed the biennial UC Rustici Rangeland Science Symposium that features scientists, policymakers, and ranchers working on key rangeland issues. “Dr. Tate has advanced a remarkable and productive research and extension career in range management and environmental stewardship,” said Department of Plant Sciences chair Chris van Kessel in nominating Tate for the award. “His program has been exemplary in bringing together diverse research and management collaborations to evaluate scientific information relevant to targeted issues, contribute new scientific knowledge, and extend tools and knowledge to serve the needs of society."